Here is the first room tour of Jewels at Home. The tours are my motivation to “finish” (and clean up!) our house, room by room. In reality, our spaces are a constant work in progress, reflecting the dynamic nature of our lives, but it’s a great feeling when a room gets to the point where it’s ready to share. Let me know if you have a room in your house to share on Jewels at Home! Our house was a fixer-upper when we bought it last year. Besides maintenance problems (clogged sewer pipe!) and cosmetic issues (pink, pink, pink! ), the house was built as a sort of grand space that meant a small number of large and formal rooms, when what we wanted as a modern family of five was more separation of spaces for sleeping, working from home, and playing. 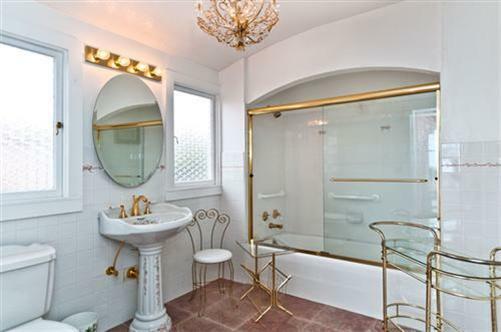 I’m glad I spent so many hours staring at the real estate brochure with floor plan, because I figured out that we could convert the “dressing room” off the master bedroom into our ensuite bath and create an entrance through a hall closet to turn the old master bath into another bedroom. 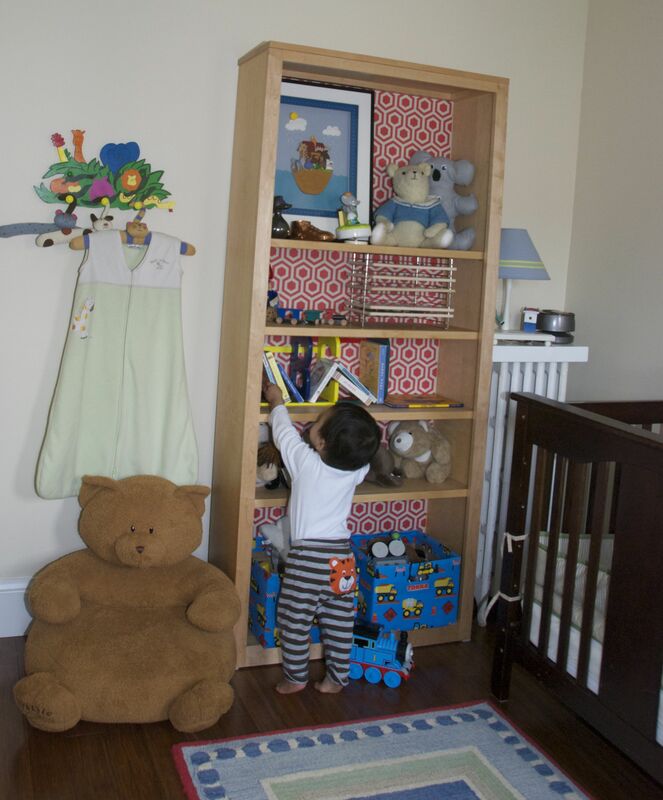 Adding the bedroom, that we are using as a nursery, has been a huge value for us. BEFORE: This space was the dated and pink master bath. By making a new entrance through a hall closet, it became a new bedroom! 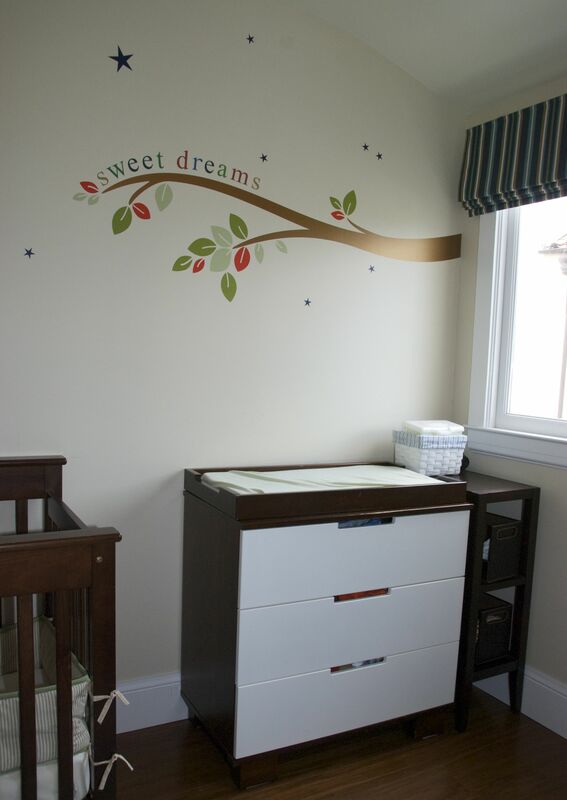 I figure the reason that the nursery was the first room in the house to be “finished” is probably because it’s a small room, and, of course, because it’s SO fun to decorate a nursery! A child’s room is a place where your imagination is the limit! Whether it’s because we are indecisive or enjoy change, we’ve moved a lot, and each of our kids has had a different nursery. I’ve loved putting them together, and while there are elements that have naturally been shared by all of them, each is also unique. Our current nursery has established itself with a whimsical retro feel. I preferred to make our kids’ first rooms pretty neutral – no car or princess themes here. I know from experience that they will develop their specific interests soon, but I chose not to make them a focus in the nursery. 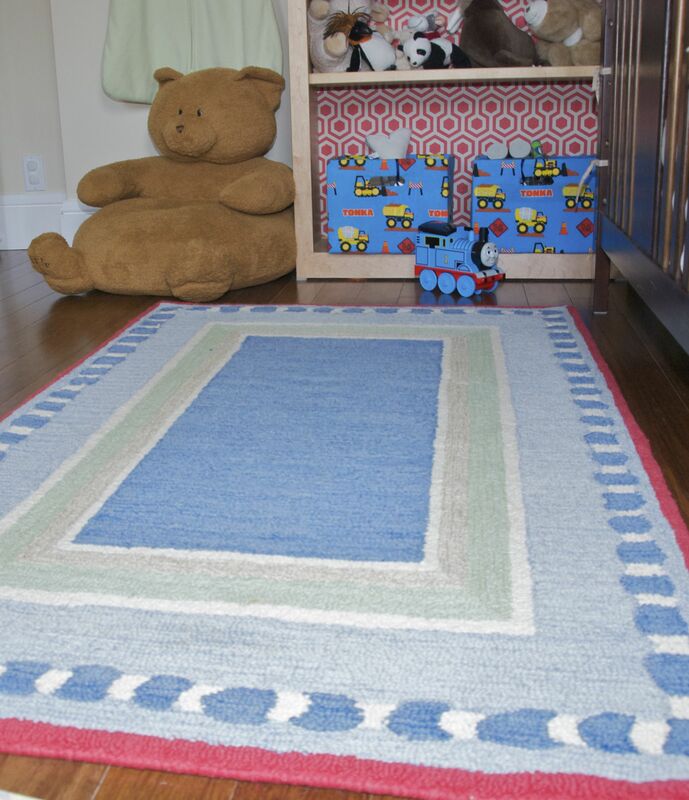 This “Connor” rug from Pottery Barn Kids circa 2003 was the jumping off point for the colors in the room. I love its palette of dark and light blue, sage, and red. 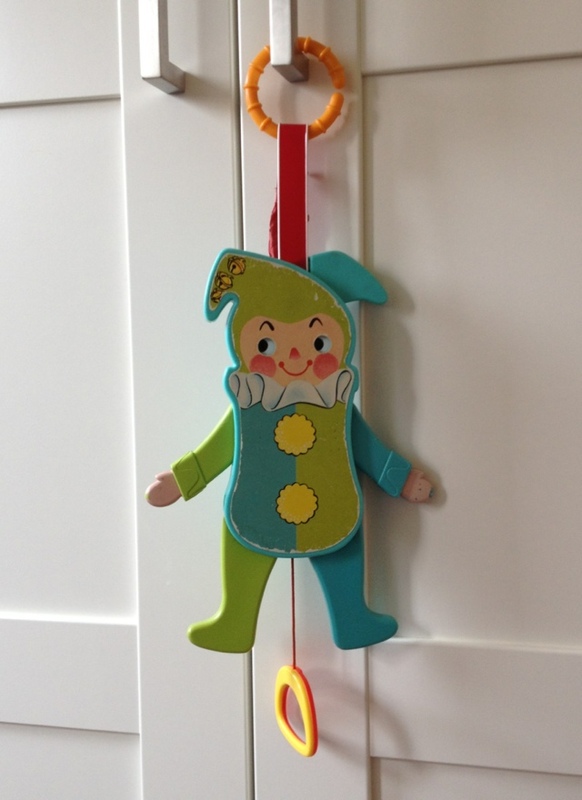 Cheerful for a child’s room, but not too juvenile and cutesy. "Connor" rug from Pottery Barn Kids has the inspiration colors for the nursery. The red is picked up by the wrapping paper on the inside of the bookshelf, and the blue in the toy bins (which are old diaper boxes wrapped in fabric!). The sage green is in the bedding, including the sleepsack hanging on the wall. The roman shades from Country Curtains are a find that I cannot recommend highly enough! They are attractive, safe and easy to use (cordless and raise and lower with a spring, like a roller shade), and inexpensive. They’re not custom, and they didn’t have a size that was right for our other rooms, or I would have bought more! Even though they have a “thermal” rather than blackout lining, I find they cut a lot of light for nap time, maybe because of the dark color. Here is our cozy chair for reading, nursing, and snuggling. The bookcase has room for display and storage. The mix of dark and light woods can work, as long as you have each wood tone in multiple places in the room. This change table is an inexpensive version of the popular modern nursery furniture. I love the wall decal of a branch right next to the window, extending the outdoors into the space. I customized it by adding the letters spelling "sweet dreams." A lot of the accessories in this room have special meaning. On the shelf and off to the right are a lot of accessories from my childhood, including the lamp, a bronzed shoe, and a “ducky bank”. 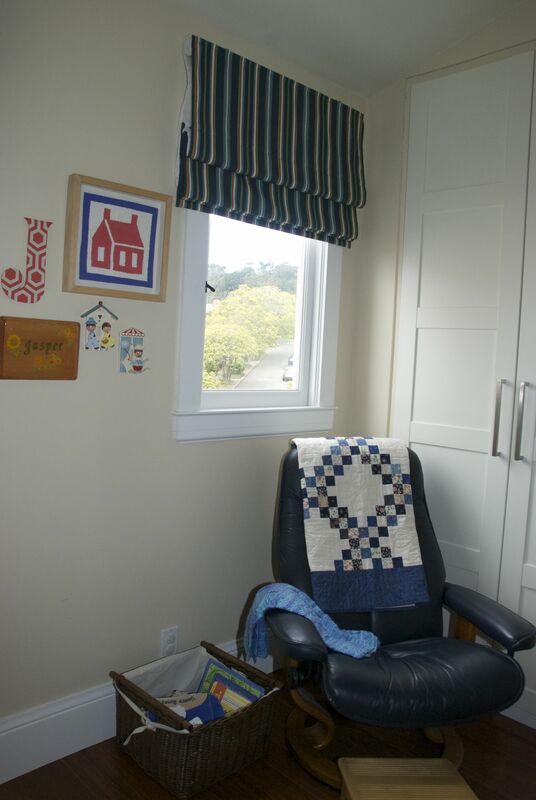 In our reading corner, I made the quilt, and my close friend knit the baby blanket on the arm of the chair. The display wall between the windows has a paper quilt block from an old friend, a name plaque with motifs from MY baby blanket, vintage switch plates from my baby room, and an oversize letter “J.” You can see how I made the letter here. The jungle animal clothes pegs next to the book shelf is special, because my mom, who did not survive to meet her grandchildren, bought this for them in anticipation many years ago. Last but not least, the squeaky “Jumping Jack” below was a gift she bought for me as a newborn baby with her first paycheck after returning to work. My parents told me, he made me laugh for the first time, and all my kids gave enjoyed him too. My baby toy is bringing smiles to the next generation. The end result of this transformation is a cozy, comfortable room that brings a smile wherever you look!